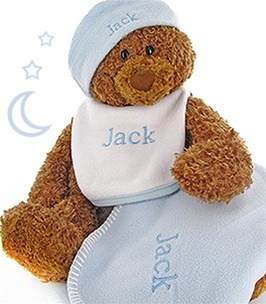 This unique baby shower gift boasts a large brown Gund brand Teddy Bear plus much more! Featuring light blue colors, this set includes a super soft fleece baby hat, a fleece bib and a fluffy fleece blanket. All 3 of these items come personalized with the baby’s name creating 3 lovely keepsakes to be treasured. The fleece blanket is made of thick polyester and it measures 29 by 29 inches square. This set arrives in a white gift box with matching ribbons too. Loved the baby's name on these items makes for a nice keepsake for years to come. The bear is big and too cute - Mom and Dad just loved this gift too!